Tamarindo is situated in Santa Cruz, Guanacaste. It is located about five hours from San Jose (the Costa Rica capital). This zone occupies an area of 123.53 km2. Tamarindo is well known in Costa Rica for its excellent beaches for surfing. It's a mecca for surfers, this beach has the largest tourist development in the Nicoya Peninsula. Tamarindo is a quiet town, which has all the necessary structure to receive tourists, with all kinds of expectations, whether you are traveling with friends, on a honeymoon, or a family vacation, this area has surf shops and trendy art galleries, large supermarkets, banks, car rentals, beauty salons, and tour operators, there are restaurants for every taste, some specializing in gourmet food, healthy, or typical Costa Rican food. There are a number of hotels in Tamarindo, for all tastes and budgets, including resorts, hotels, B&B to hostels and budget backpacker hostels. Tamarindo also offers beautiful sunsets, but the fun does not end there since the area has many bars and clubs open for you to have a drink and dance through the night. In this area the weather is warm all year round, so remember to include in your luggage, shorts, shirts, a hat, a pair of jeans, plus a thin long sleeve shirt for the rainy days. This is should be sufficient for your vacation. The sun shines almost 365 days a year, even in the rainy season (from May to October), but you can expect a brief rain in the afternoon. 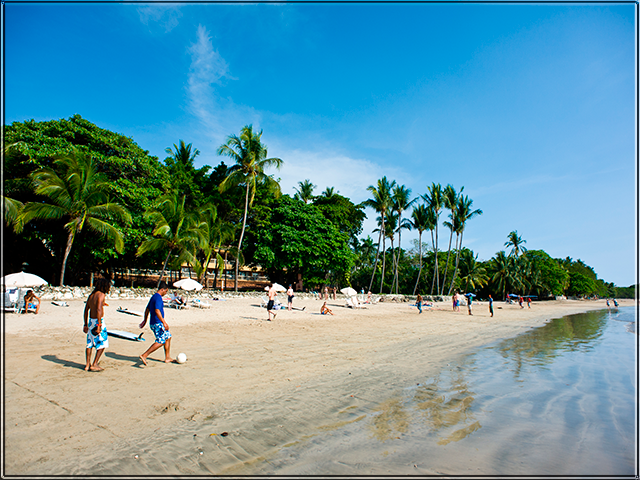 Tamarindo offers many activities that can keep you busy for your entire vacation. For the more adventurous, you can rent snorkeling gear and spend the day exploring the variety of animal wild life the sea has to offer, so be prepared to see some amazing creatures. If you do not want to have much contact under the sea water, there are activities that you can practice here such as surfing, kayaking, sailing, and fishing. Surfing is very popular in Tamarindo, whether you want to practice or just watch the surfers on the beach. This area is a good place for novice surfers; if you do not have the necessary experience, you can always enroll in some surf classes. You will find many surf schools here, and they will be unforgettable. If you're more experienced, you can enroll in a customized surf tour. In addition, you can take tours like horseback riding, ATV, rent a bike, rafting, hiking, golf and more. It is important to keep in mind that Tamarindo beach has strong currents and submerged rocks, so be careful when swimming. The most attractive part of Tamarindo is its proximity to the Tamarindo National Wildlife Refuge, comprised of 1,000 acres (400 hectares) of protected forest, including abundant mangroves and estuaries. The Tamarindo Natural Wildlife Refuge is one of the largest nesting sites of the leatherback turtle in the world in conjunction with the Las Baulas National Park. In 1993, the Tamarindo estuary obtained the World Importance Wetland declaration by the Ramsar Convention. Here you can arrange tours to see the fascinating animals and plant life; also, near Tamarindo, you can visit the Ostional National Wildlife Refuge and the Barra Honda National Park. This area is easily accessible, if you arrive at Daniel Oduber International Airport in Liberia, the best option is to rent a car. This airport is just an hour from the beautiful area of Tamarindo. But if you are traveling from San Jose the Costa Rica capital or from the Juan Santamaria International Airport we recommend travel in shared services. Interbus offers this shuttle from the main Costa Rica Tourist Attractions; if you want to book your shuttle Enter Here or if you want to see all the Interbus routes, Click Here. Another way to travel to this beach is traveling on a domestic flight, the companies responsible for providing these service is Sansa and Nature Air.